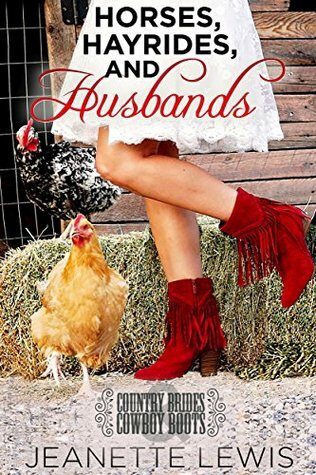 About the book: Enjoy this sweet romance from the Country Bride & Cowboy Boots series. My review: Don't you just love the fun cover for this one! I love the chickens and the red boots, the whole thing just fits the main character in this one, Misty! I love Misty in this book! She's made some choices that she regrets, but instead of dwelling on that she just moves on and takes one day at a time. I love the way she's such a good mom to her little guy, Wyatt. She also works very hard with her brother Ty. I love the way she met Travis and they immediately hit it off, even though he was a bit gruff to her at first. It was too bad that she felt she had to lie to him just a little about who she was and what she did. But with the way he acted when she met him, it's a no brainer that she had to! Travis is a good guy, but he has an amazing dislike for anyone rich, thus the little lie that Misty had to tell. I love the way he goes out of his way to help everyone around him, from his boss to Misty someone he'd barely met. I loved the way he treated Misty's son, it was obvious that he was a great guy and that he'd be an amazing dad, way better than any of Misty's other dates or even Wyatt's birth father. I love that he comes up with cute dates that he can take both Wyatt and Misty on. The chemistry between these two characters was so fun to read about! This book has a really cute plot and great characters! It's a cute, quick read that I really enjoyed. I didn't want to stop reading about Misty! I was sent an e-book of this book in exchange for an honest review. This post contains an affiliate link, which simply means that if you click on my link and make a purchase I receive a small amount of money in return.